For over 20 years, SAFEChecks has NEVER had a check replicated and used in a check fraud scam! Check fraud is the most dominant form of payment in America, and produces more losses than any other form of payment fraud. Every company, organization and individual are at risk. SAFEChecks fully understands the magnitude of this crime, having helped countless clients throughout the United States remain fraud-free and protected with our high security checks. While no bank, product or program can provide 100% protection, our High Security Checks, Secure Check Writing Software, and Positive Pay Software will help you build the strongest defense against check fraud. Our checks are unrivaled in the industry, featuring securing ordering procedures, controlled paper stock, and designed by Frank W. Abagnale with numerous security features. Compare your current checks with ours. Call today for a free check analysis! In over 20 years, SAFEChecks has NEVER had a check replicated and used in a check fraud scam! Switching check vendors is incredibly easy. Our trained check fraud advisors will handle the entire process for you! 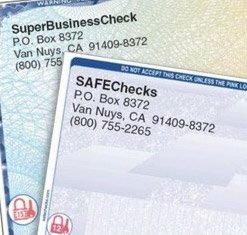 SAFEChecks, “The Check Fraud Specialists” manufactures the finest high security checks in America. We began in 1993 as a division of a Southern California business bank battling an epidemic of check fraud. Check fraud attempts at the bank had skyrocketed from $90,000 to $3,000,000 in just two years. Greg Litster, SAFEChecks' President, was then a Senior Vice President of the bank and was assigned responsibility for solving this crisis. At Mr. Litster’s recommendation, the bank hired Frank Abagnale as a consultant. Fraud Happens. Check fraud is the #1 type of payment fraud in America. As a business, you’re already at risk. We’ll help protect you. The Frank Abagnale SuperBusinessCheck is unmatched in fraud protection. Build the strongest defense against payment fraud and get maximum check security. It’s incredibly easy. Switching check vendors is easier than you might think! Call us and get started today. 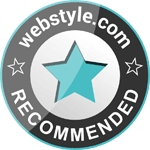 To request a hard copy for you or your clients, call: (800) 755-2265.